College student was removed from class for allegedly having her feet on a seat. Education officials in Texas launched an investigation into the possible discrimination of an African-American student after a white lecturer was recorded on a cell-phone video having police remove her from a classroom -- allegedly, according to witnesses, for having her feet on the seat in front of her days earlier. Many are saying this is the latest in a string of incidents in the United States of white people calling the police on black people who are seemingly going about their normal lives. Many of the incidents have been recorded on cellphone videos -- and have exploded on social media. The new incident occurred on Monday in a biology class at the University of Texas at San Antonio, Taylor Eighmy, the school's president said in a statement. "While the facts aren't fully known regarding [the] incident, our Office of Equal Opportunity Services is already conducting an investigation into possible discrimination," Eighmy said. Eighmy said a second "inquiry regarding the academic management of the classroom" is being conducted by the university's interim dean of the College of Sciences. "Beyond this particular incident, I am very much aware that the circumstance represents another example of the work we need to do as an institution around issues of inclusivity and supporting our students of color," Eighmy said in his statement. "This concerns me greatly, and it's incumbent upon us as an institution to face this head-on. It's something that we need to address immediately as a university community." 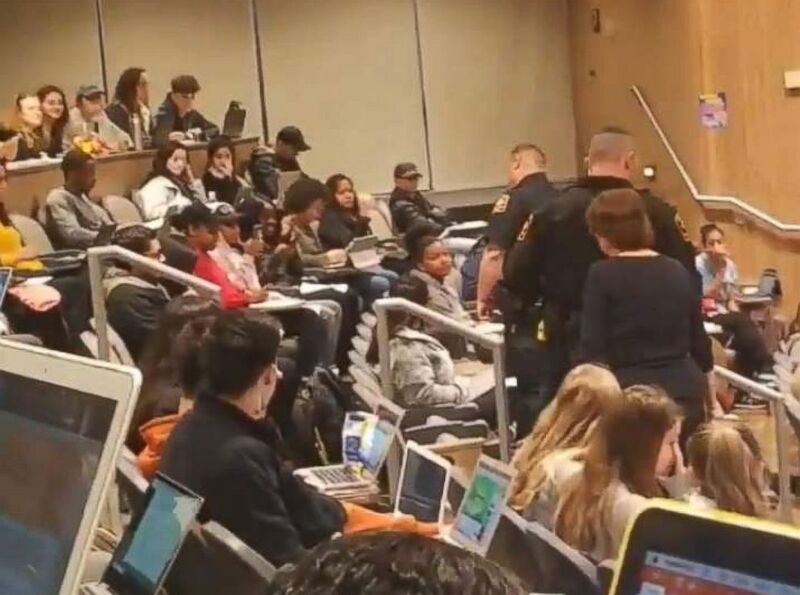 (judith_77980/Twitter ) An African American student at the University of Texas at San Antonio was removed from class by police after her biology professor reportedly complained she had her feet on the seat in front of her. After a classmate's video of her went viral on social media, the student who was removed from the class addressed the controversy on Twitter. "Upon entering class I was told I needed to leave or would be escorted out by officers, I never disobeyed the student code of conduct. Not once," wrote the student, tweeting under the handle @FavoritePaigeee. "A police report is being filed atm [at this moment], this is just the beginning. Thanks for your support!" Apurva Rawal recorded video of the incident with his cellphone and posted it on Twitter, writing, "So this happened today in class, a girl had her feet up and the professor called the police after calling our class uncivil." "The girl who was escorted out had her feet up on a chair in front of her, there was no one around her and she wasn't disturbing anyone," the student, who asked not to be identified, told ABC News. "However, the professor went up to her and told her to please place her feet down and she did. A few minutes later [the student] had her feet in her own chair now, so the professor once again went up to her and told her to stop and she did. A few minutes before class ended [the] professor gave a speech about civility and told us that we were the most disruptive class and we never paid attention." 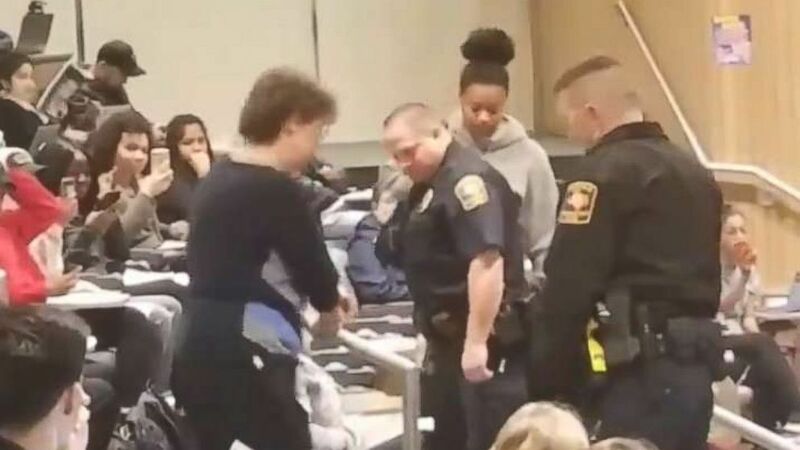 On Monday, the lecturer began the class by handing out a paper on civility and walked up to the African-American student she had scolded before about having her feet on a seat and spoke to her prior to calling the university police, the student told ABC News. She said her African-American classmate didn't have her feet on the seat Monday before police were summoned, but had just walked in and sat down. "I did not believe she was calling them [police] but, sure enough, they came a few minutes after she had stopped talking on the phone," the student said. "They escorted [her] out and once the police had left out of the classroom, a lot of students started telling [the lecturer] she had done wrong, she was being disruptive of class time and she had taken matters out of control."